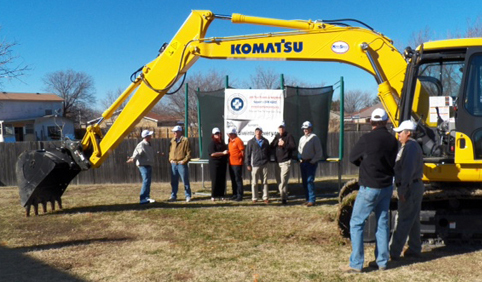 On January 13, 2014, a groundbreaking ceremony took place at the North Texas home of Mario and Kris Torres. Members of The Association of Pool and Spa Professionals (APSP) for the North Texas chapter were on hand to start what will be a new swimming pool for Mario, Kris and their children. But this is no ordinary pool, and Mario Torres is not just another pool owner. Sargent Mario Torres joined The United States Army in January 2004. A multiple medal recipient, Sargent Torres served in Iraq and Kuwait from December 2004 to December 2005. After serving our country for several years thereafter, Mario was admitted to a Wounded War Unit in Virginia in 2008. Mario, who has PTSD, was honorably discharged with a medical retirement in January 2010. APSP, working with VFW Post 4380 in Plano, Texas, selected Mario and his family to be the first recipients of their annual Dive Into Recovery swimming pool. The mission of Dive Into Recovery is to promote the health benefits of swimming, with the goal of helping local heroes heal through water therapy. Mario’s pool will be built at no cost to the Torres family. The North Texas APSP chapter is one of the first chapters to embrace a program like Dive Into Recovery, and they are hopeful that other chapters across the US will establish similar programs for our veterans. If you would like more information on this important program, please go to www.diveintorecovery.org .